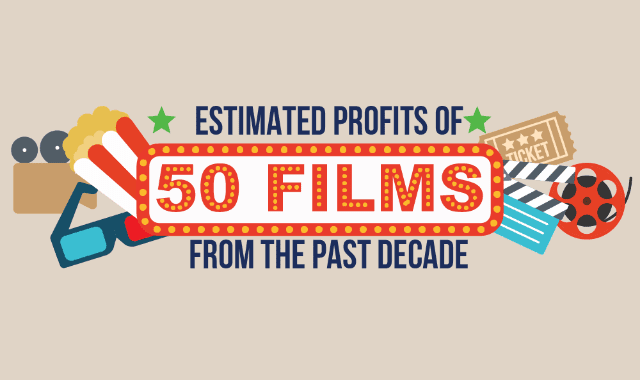 Estimated Profits Of 50 Films From The Past Decade #Infographic ~ Visualistan '+g+"
The production costs that go into creating a new film can be outrageously high, in the hundreds of millions, but the profits that are earned after the release have proven to be well worth the expense! From the highest grossing to the Oscar Best Picture winners to the highest Metacritic scores of the past decade, these 50 well-loved films have earned sky high profits. This infographic shares the monetary workings of some fan favorites, you’ll see quite a few mentions of Harry Potter and Pirates of the Caribbean, and even the latest Indiana Jones movie made it’s way on to this exclusive list. DC Comics and Marvel battle it out over which of their heroes and villains are more profitable, with Marvel’s The Avengers coming out on top. Even 8 years after its initial release, Avatar is still sitting pretty as the clear winner with their remarkable $2.55 billion in estimated profits!